There are some things that are such an awesome deal they supercede quality. In fact the occurance is so rare, that when you find the deal, you are so excited, you forget what the thing you’re eating even tastes like. The under $10 buffet. Steak & Eggs in Vegas. Taco Bell in the old days. And of course… 99 cent pizza. Pizza is everywhere in New York. Good pizza is everywhere in New York. But you never see a slice below $2. And in Midtown, the price is sometimes jacked up to a ridiculous $2.50 a slice. Nevermind wanting toppings or a drink. The pizza is good… but a lunch ends up costing you $7… for pizza. Enter 99¢ Fresh Pizza to save the day! Well, on Monday I was excited to find out that 99¢ Fresh Pizza has expanded East, opening a new location next to Grand Central Terminal, on 43rd St. btw. 3rd & Lex. Pics of the pie and the +/- after the jump. Don’t expect the greatest New York pizza you’ve ever experienced. You get what you pay for. If a pie costs $8, it is probably not going to be as good as a $17 pie… but for $1, how can you complain? And of course, it’s so cheap you’ll convince yourself it tastes better than it actually does. It’s got plenty of cheese, and there is always a fresh pie (although this location is new- so the turnover may not be as quick as the Port Authority Location). The sign on the window says there are toppings available for 50 cents a slice, $2 per pie… but once you start down that road, it’s not 99¢ pizza anymore, and must be held to a different standard. It’s a fresh slice of pizza… for 99 cents. Deal of the century. At the Port Authority location there is always a line, and always a fresh pie coming out of the oven. This location is new, and may take awhile to get the turnover going. No variety. The only thing they usually have pre-made is Cheese. I’ve never asked for toppings because then it wouldn’t be 99¢ pizza anymore. If you are willing to wait until after 2pm, I’ve heard there is real pizza place in the same area that drops its price to $1 a slice. Posted by Zach at 8:22 am, January 17th, 2007 under 43rd btw. Lex+3rd, 99 Cent Fresh Pizza, Pizza. I’ve been waiting for this place to open…yea! Most slice joints are subpar anyway, so I’d rather pay 99 cents than $2.50 for what amounts to the same thing. where is this mysterious real pizza place that drops down to $1 a slice after 2 pm? Naples 45 in the MetLife Bldg on Park Ave. (and 45th). I am going to write about it as soon as I can find a day where I don’t pass out trying to make it until 2pm without eating lunch. Been hitting the PA location for a couple years now. Never disappoints. Ok, it never blows you away either, but whatya expect for a buck? Best part about it is the slices are always fresh due to the sheer volume they sell. Decent, fresh pizza for a dollar will always beat the reheated, three-hour-old slice for two-fifty. 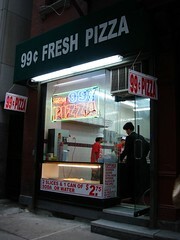 I ate at the 99 cent pizza near Grand Central today for first time. Despite the cold, there was a long line of people, so turnover was apparently high. It appeared that the place sold only pizza (no heroes, pastas etc) so they keep their operations simple and cheap. The pizza was surprisingly good. Perhaps not the best pizza in NYC, but definitely worth the price. I have worked in Pizzerias for many years. The ONLY way that you can sell a slice for 99 cents is if you put LITTLE or NO cheese on the pizza. AND / OR, the quality of cheese is synthetic. WHICH BELIEVE ME, MANY PLACE USE THIS. With the price of milk going up all the time, it effects cheese also. They are definitely NOT using the best quality. Would u expect best Quality for $1, you gotta be out of your mind! For me, that $1 pizza is AWESOME. When I’m out late swing dancing in NYC I work up an awesome appetite. From the mid-40′s, I typically head down 9th Ave to the Lincoln Tunnel towards NJ. First, though, I stop for a bite even though my wallet may be light. The pizza is best during the depth of the pre-dawn morning in mid-January, when the air itself is frozen and that warm pizza hits your tummy. Ummmmm. Seems like another 99 cent pizza place opened up between 43rd and 44th off of 3rd Ave. I passed it on my way to Blarney Stone today. 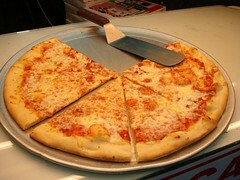 Clarification – this post is about $0.99 Fresh Pizza on 43rd btwn Lex and 3rd. Andy is talking about Prince Deli, which is on 3rd Ave. btwn 43rd and 44th (and used to be located on the SE corner of 3rd and 43rd). I’m guessing that Prince Deli noticed that no one was buying pizza from them anymore, and decided to drop their price to compete. It’s better pizza, but not by much. Z Deli on 8th Ave betw 48th/49th has 99c slices of cheese pizza, and they are open 24 hours. The quality is on par with the rest of their pizza. I think it is just a gimmick (that works!) to get you in the deli as they have plenty of other drinks and food available. I have walked by the place on 43rd off 3rd several times and there is always a line out in the street (it is a very small place with no seating), so I never tried it. Right around the corner is the other place with cheap pizza. There is a line there too, but it is inside and there are a few seats. They also have many other things besides pizza, like salads and Mediterranean foods. Hey. On the corner of 8th ave. and 36th St. theres Halal Pizza & Bakery which serves up some good 99cents slices. I use to always buy from there when I to worked in the area and they were always good. The bakery is also good..
Great pizza. I was visiting Ny, staying in Jersey and made it my 1st stop almost every day before getting started on wasting the days away. Didn’t even need the navigation system in my buddies car after the 2nd visit. I memorized the route from Seacaucus. Hell of a bargain!